I have an overwhelming feeling of pure and complete contentment at the moment. Not to be mistaken for happiness, for I feel that implies a sense of giddyness and a certain spring in ones step accompanied by a most definite Cheshire Cat grin (or at least it does in my case). No, this is most definitely contentment. Calm, peaceful, inhale deeply, exhale slowly, contentment. Why? Because of my coffee. This is quite ridiculous I know, even more so because I am not a big (or small) coffee drinker. However, this is different. This is no ordinary cup of coffee. 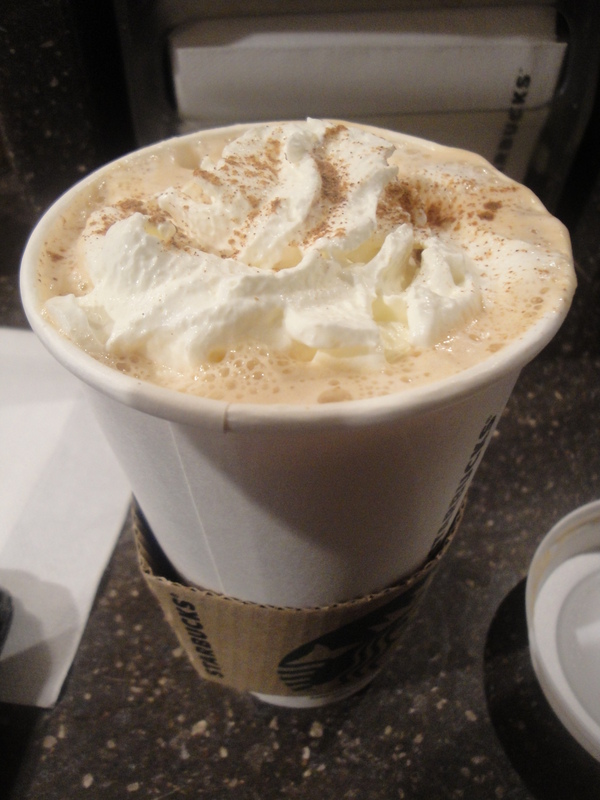 This is the Starbucks’ Pumpkin Spice Latte. Oh yes. I have had people request their local Starbucks hold back some PSL mix for my visit so it would be there when I visited (yes, again, my people are amazing). This drink conjures up so many memories of thick socks, hands in pockets, and pulling your jacket that little bit tighter to keep in the warmth. I am almost willing to call this season ‘Fall’ even though I know it to be autumn. I was introduced to this beverage three years ago on a cold autumn New York afternoon. My friend Bobby and I were having one of our walking and talking moments and he stopped on the corner of 35th and 7th. That I remember exactly which Starbucks, in a city where this is one on every corner, demonstrates how important a moment this was. We went inside, and rather than simply ordering me my first Pumpkin Spice Latte, Bobby managed to get the lady behind the counter to give us the drink for free. Something about not wanting me to have a whole one in case I didn’t like it, but she said she would have to make it anyway so we could just have it. This may actually be why I remember it so clearly, because it’s one of my favourite Bobby Moments, rather than the start of my love affair with the Pumpkin Spice Latte. Whatever the reason, it makes for a good story. This drink was part of so many of my favourite moments, and now that Starbucks has brought it to London, I get to enjoy it whilst I walk the streets of my own city! I feel that I am now ready for autumn. Let the clocks go back, let the colder days come. I will hold my Pumpkin Spice Latte in my hand and fall in love with my city as the leaves turn golden and wish my NYers were with me to share these moments, but perfectly content because my LDNers are with me.